Few television shows in history have been as densely layered with tiny nods, callbacks, and references as Arrested Development. From the very first moments of the very first episode when the show premiered in 2003, this singular sitcom has built a loyal audience with a massively talented cast and Rube Goldberg-style setups for intricate jokes. Over only a handful of acclaimed seasons, it quickly cemented its reputation in the annals of television history by burying more blink-and-you'll-miss-it gags in a single episode than most shows manage to tell in their entire run. Even after 15 years and five seasons, there's always money in the banana stand, and there were plenty of quick gags you probably didn't catch in the most recent batch of episodes. From references to the actors' past roles to meta-textual acknowledgements of behind-the-scenes scheduling conflicts, we've rounded up all the small details you missed in Arrested Development season five. Arrested Development is known for making jokes about everything from incredibly niche Southern California living to more broad contemporary political jokes that are still "solid as a rock." 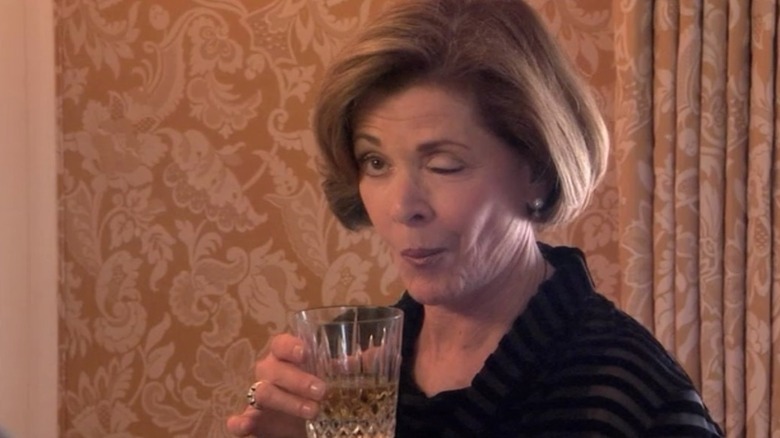 But some of the best jokes in Arrested Development history have come as sly references to actors' past roles — whether it's Buster (Tony Hale) doing the Mr. Roboto dance years later or Henry Winkler's Barry Zuckerkorn jumping the shark, the show is constantly referencing its stars' pop culture history in dialogue or visual gags. That proud tradition is upheld in season five when Michael (Jason Bateman) sees a cleaning lady exit Lucille 2's (Liza Minnelli) apartment carrying a basket full of adult toys. "Boy, it's like the Weimar Republic in that place," he remarks — and he isn't wrong. In fact, it's a reference that should be familiar to any Minnelli fan — Cabaret, one of her best-loved and most widely acclaimed films, takes place in the Weimar Republic. 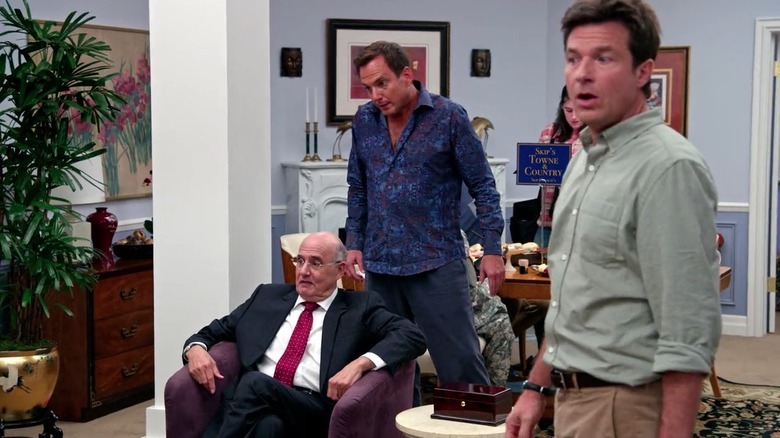 When it isn't dishing out references to past seasons and past roles, Arrested Development's fifth season is busy establishing new running gags — including one that consistently repeats a Bluth axiom coined by Lucille (Jessica Walter): "Forget, but never forgive." A misunderstanding of "forgive and forget," the saying pops up in a few different places throughout the season as a sign of how morally bankrupt the Bluths are. Sharp-eyed viewers may have noticed it also makes an appearance in a letter Michael mistakenly believes Lucille 2 wrote forgiving his $700,000 debt. As it turns out, it was actually written by Lucille Bluth, and there are a few clues to key in the audience long before Michael figures it out. For one, the letter explicitly states that the debt has been "forgotten," not forgiven. Leave it to Lucille to forgive an outstanding debt by explicitly not forgiving it. One other clue that it was written by Lucille Bluth impersonating Lucille 2? The signature literally says "Lucille 2," a nickname that the Bluths have for Lucille Austero instead of her actual name. It's been [insert length of time]! 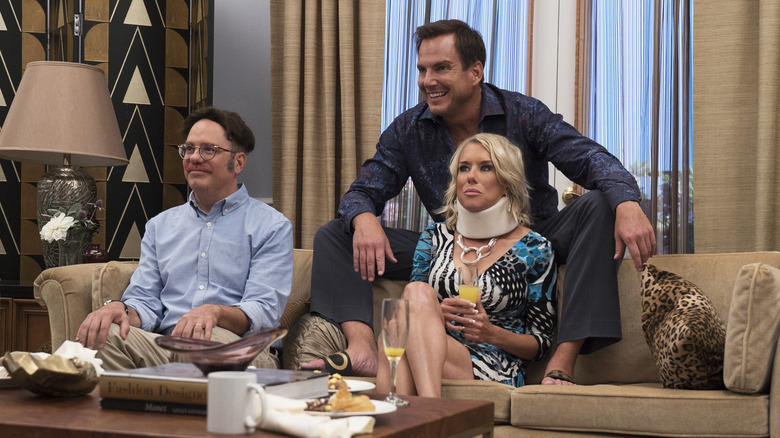 Arrested Development has followed a long, twisted road since its premiere. After the show was canceled at Fox, it took almost 10 years for the fourth season to make its way to Netflix, and the storylines in that season necessarily dealt with the intervening years more or less in real time. Season five, on the other hand, basically continues where season four ended. Even though it arrived a full five years after season four, the show continues as if it's only been a few months. Gob (Will Arnett) and Michael have a meta-textual back-and-forth about that amorphous length of time. Gob greets Michael with "Come on, I haven't seen you in a year!" To which Michael responds, "It's been two months." Fittingly, neither of them are actually right, since it's been almost half a decade since the show has aired new episodes. It isn't the first time the two brothers have drastically misunderstood something incredibly simple. The Bluths have gone through some major changes in the years since the series premiere as the actors have aged and (in one case) retired. In addition to changes in physical appearance, many of the characters have tried on different identities: George Michael (Michael Cera) hid his identity by using the name George Maharis (a sneaky joke of its own), while Maeby (Alia Shawkat) and Tobias' (David Cross) have adopted a number of disguises. They're not the only ones — the restaurant Skip's Church (named because it's where you go to eat when you're skipping church) made a triumphant return during Arrested Development's fifth season when they catered Lindsay's (Portia De Rossi) campaign meeting in episode 3. Like the Bluths, the restaurant's gone through some changes: it's now called "Skip's Towne and Country." The new name's got deeper meaning than one might think — multiple Bluths end up skipping town (and also the country) throughout the season. That's a pretty big escalation from skipping out on church on Sundays, but we can't see we didn't see it coming. Speaking of Tobias, Maeby, and their shared penchant for disguise, season five is a veritable cornucopia of references to past outfits. Maeby briefly wears an old lady disguise before realizing that she looks just like her father… who had worn a similar outfit while pretending to be Mrs. Featherbottom in an extended homage to the classic Robin Williams movie Mrs. Doubtfire. 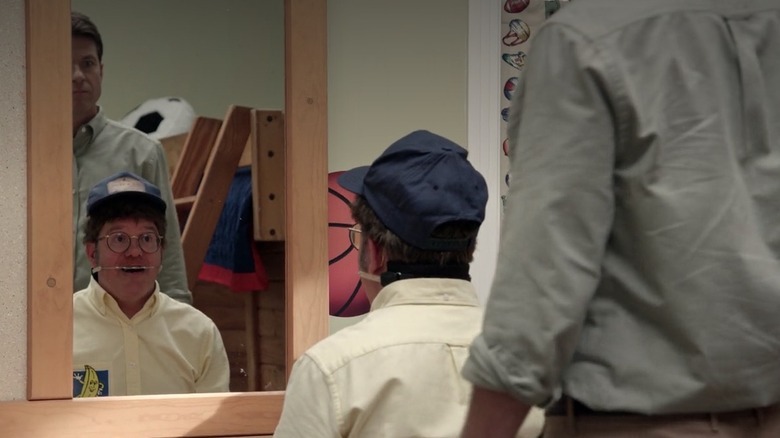 Her father, meanwhile, tries to dress like George Michael by wearing a classic Bluth Banana Stand t-shirt and a cap from Mock Trial with J. Reinhold. It's fitting that both of these characters have to take a good hard look at themselves as they regress through the years of past disguises and Arrested Development plots. Of course, both of them go right back to disguising themselves, so maybe there wasn't that much contemplation after all. On the plus side, the father-daughter duo clearly has more in common than they thought. 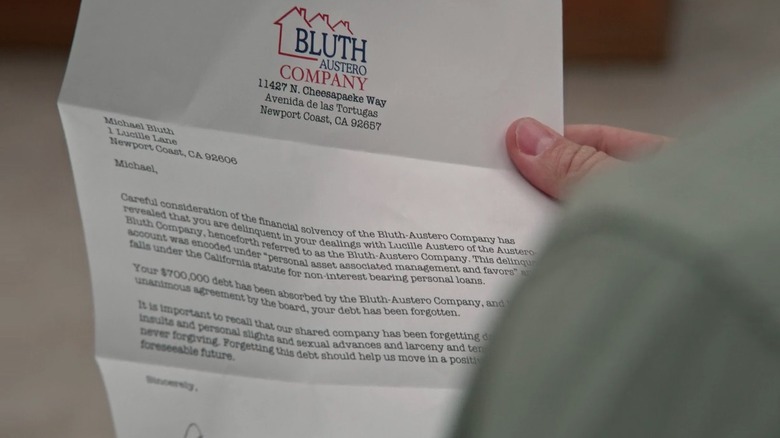 A running subplot in season four involved Michael going around to get his family's signatures in order to approve their likeness for a movie based on the Bluth clan — a gag that could be seen as a metatextual nod to producer Mitchell Hurwitz's own difficulty in getting all the stars of Arrested Development to come back together for another season. By the end, Michael has spitefully torn up nearly every single family member's release form, making the odds of a Bluth movie basically nil — despite how passionate Ron Howard was about the movie being the perfect role for his daughter Rebel Alley (Isla Fisher). Despite all that, it seems Howard was able to make a Bluth-related movie for Rebel to star in anyway. When George Michael watches a movie in Mexico with his friends, he points out that he used to date the star, and the boys — who've been watching with their hands raised in order to block the Spanish subtitles — appreciably lower them to better see the screen as Rebel yells, "Say goodbye to these!" The film is pretty clearly dipping into the life story of Bluth secretary Kitty (Judy Greer), a woman with a penchant for yelling an identical line before flashing whichever soon-to-be-ex-lover she was talking to. 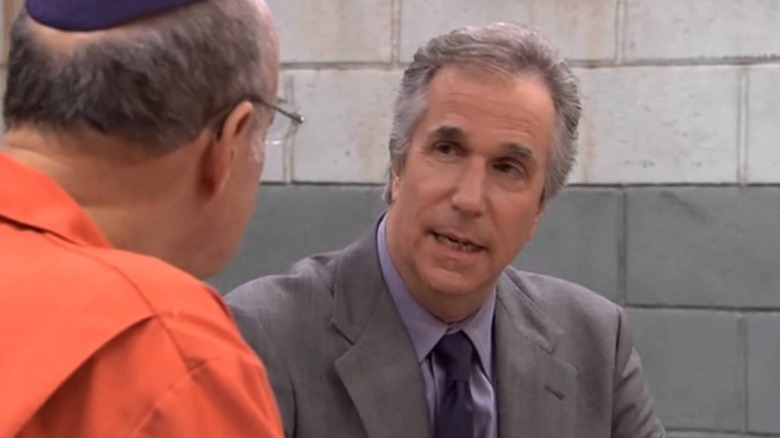 It's long been a running Arrested Development joke that Winkler's Barry Zuckerkorn is kind of a terrible attorney. Whether it's not actually reading a plea deal (it was very long) or encouraging his clients to "take to the sea," the optimistic lawyer perpetually seems completely clueless. It's no wonder that George Sr. (Jeffrey Tambor) often bemoans that he's got "the worst [bleep]ing attorneys." Still, maybe some sympathy should have been saved for Barry, since he winds up in jail in season five after being told that the only way to communicate privately with a client in prison is to to be arrested and imprisoned himself. Granted, he probably should have known that was horrible advice, but is it any wonder that he find himself sighing, "I've got the worst [bleep]ing clients?" Considering that he's represented the Bluths through five seasons of shenanigans that run the gamut from "light treason" to divorce, he's not exactly wrong. It's the law of the jungle when it comes to businesses that offer convenience. Local movie store rentals were replaced by Blockbuster, which was replaced by Netflix; eventually, no matter what you're offering, something faster and more convenient will eventually come along. Gob gestures at this inevitability when he shows Michael around the new Bluth company headquarters, which have moved up a single floor to replace the offices previously occupied by "2 Hour Teeth." "I guess it was the 90 Minute Teeth guys across the street that put the 2 Hour guys out of business," muses Gob. "I did see that the old Blockbuster is becoming an 'Hour Mouth,' so those guys must be s***ting themselves." 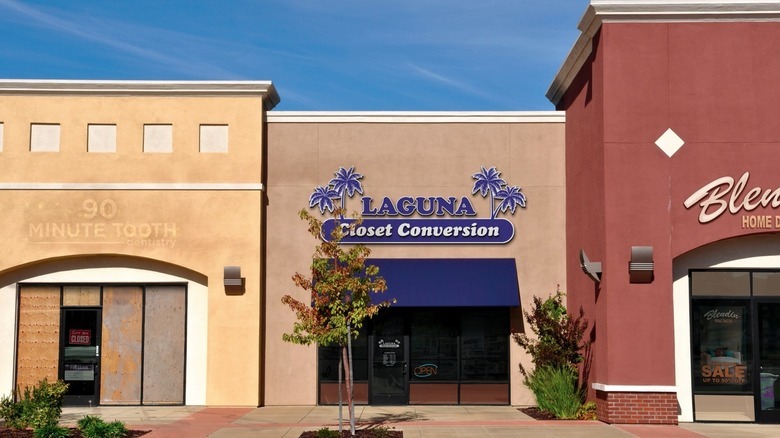 Gob's prediction ends up coming true when we see an abandoned "90 Minute Tooth Dentistry" building right next to the Laguna Closet Conversion office that Gob ends up buying. We'll have to see if "45 Minute Tooth" supersedes "Hour Mouth." When you lie as often as the Bluths do to each other, it's sometimes easier to just continue lying than actually admit the truth. Gob certainly follows this rule of thumb when he "admits" to Michael that the celebrity he was dating in season four (and still mourning in season five) was Julie Bowen — instead of admitting the truth that it's actually Tony Wonder (Ben Stiller). It's a callback to season four, when the brothers both briefly worried that the fact that they were each dating a celebrity meant that they were both dating the same celebrity, although in Michael's case it was Ron Howard's fictional daughter Rebel Alley, while Gob was "dating" Tony Wonder. In any case, the brothers each briefly experience a flare of jealousy at the idea that the other one is dating Modern Family star Julie Bowen in a bizarrely heated exchange. Considering the rough family life they both have, maybe the idea of an unconventional but ultimately loving family is appealing. The Bluths don't generally have a lot of wisdom to offer, except in a "do as I say, not as I do" sort of way (although really you shouldn't even go that far). Their history of generally ill-advised antics didn't stop George Sr., however, from selling Caged Wisdom, a line of self-help movies filmed from prison. 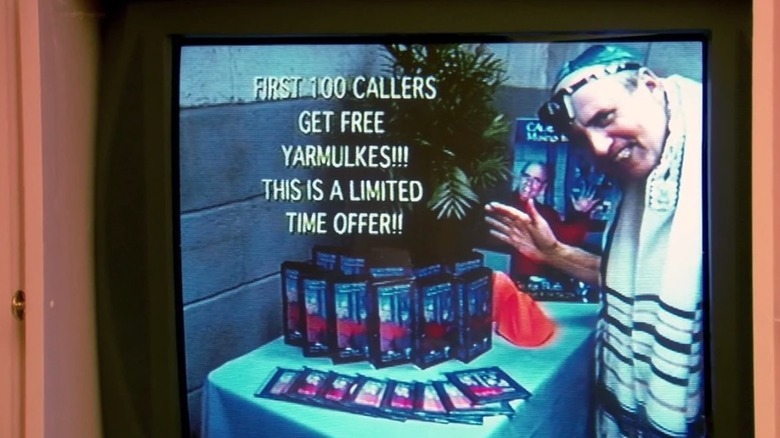 Despite the fact that his conversion to Judaism was just part of a plot to more easily get himself out of jail, it became oddly popular with some of the wacky minor characters in the Arrested Development universe. Maybe it was that brief spurt of popularity that encouraged George Sr. to try and offer Buster some "Caged Wisdom" in the fifth season, when Buster went to prison. Still, despite his best intentions, George Sr.'s advice that Buster fight a skinhead just leads the perpetually confused Buster to try and choke out the balding Ron Howard. It seems like age hasn't really granted any of the Bluths any real degree of wisdom, caged or otherwise. As much as Arrested Development tends to reuse jokes and concepts, it's got nothing on the Bluths themselves. If they can reuse party supplies, to point to just one example, they'll do it for all it's worth. One very well-used Bluth object makes a return in season five: the party banner they've hung for the "welcome back from prison" parties that they've thrown for almost everyone in the family at this point. Instead of buying a new banner each time, they just add the new name and cross off the old one. What once read "Welcome Home from Jail, Father!" now has "Father," "Oscar," and "Mother," hastily scratched in and then crossed out when replaced by the new name. 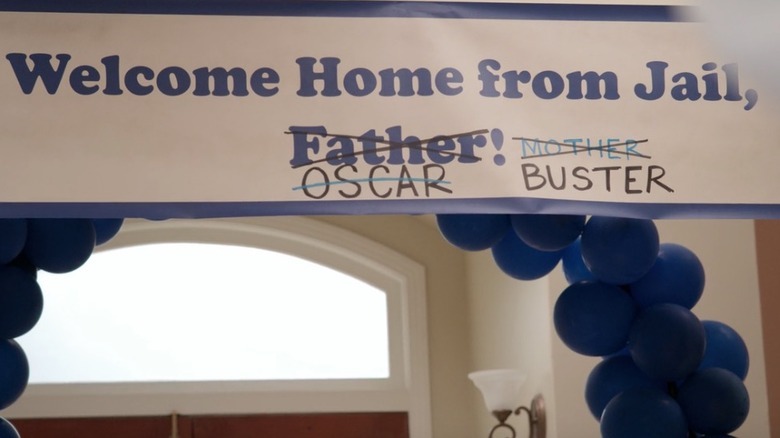 In season five, the banner is put up to welcome Buster home, but we'll see if the rest of the family's names don't also end up on it before the series ends.